After nine years in the West End, producers have announced that Jersey Boys will end its run in March 2017. The show, which originally opened 18 March 2008 at the Prince Edward Theatre before moving to the Piccadilly Theatre in March 2014, is currently the sixth longest running musical in the West End. It will finish its run at the Piccadilly Theatre on 26 March. The show will embark on a second UK tour in December 2017, with beginning at the New Alexandra Theatre, Birmingham. Michael David the producer said: “We hoped that West End audiences would embrace it, but you never imagine it’ll multiply and resonate as much as it has. We couldn’t be more proud of the cast and crew who gave their all every night, and are profoundly grateful to the audiences who returned that energy without fail. The musical is the true story of Frankie Valli and the Four Seasons and their rise to fame. It features songs including “Beggin'”, “Sherry”, “Walk Like a Man”, “December”, “1963 (Oh What a Night)” and “Big Girls Don’t Cry”. It is written by Marshall Brickman and Rick Elice, with music by Bob Gaudio and lyrics by Bob Crewe. 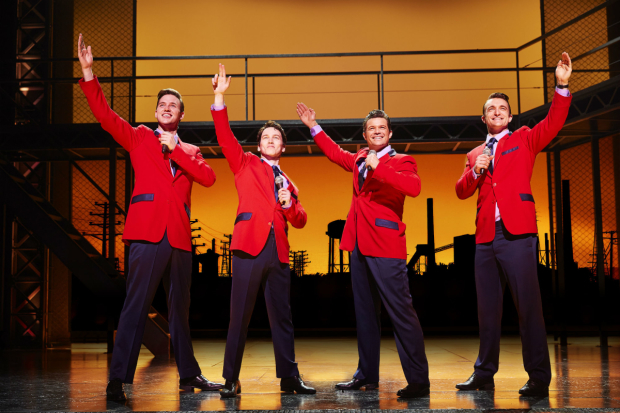 The current London cast of Jersey Boys is led by Matt Corner as Frankie Valli, Simon Bailey as Tommy DeVito, Declan Egan as Bob Gaudio and Matt Hunt as Nick Massi. Jersey Boys runs at the Piccadilly Theatre until 26 March 2017.